Preparation of guidelines for research infrastructures in the Danube region followed the 3rd Dialogue Workshop! 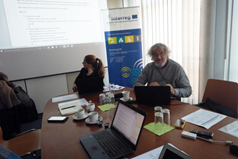 The meeting in the end of November 2017 aimed to progress on region specific Ex-ante guidelines, monitoring guidelines and the socio-economic impact assessment of research infrastructures in the Danube Region. The ResInfra@DR project focuses on research infrastructures (RIs) in the Danube macro-region and offers mutual learning opportunities for policy makers and policy delivery organisations dealing with the financing of RIs and hosts organisations involved in the operation of research infrastructures. Workpackage 3 (WP3) of the project puts a focus on the dialogue of key actors including also business users of RIs. In this context the ResInfra@DR consortium partners recently met in Vienna to prepare within three thematic groups the specific guidelines. This meeting followed the 3rd Dialogue Workshop at the University of Natural Resources and Applied Life Sciences (BOKU) on 21st of November 2017 and reflected major lessons presented. The work will cumulate in guidelines including region specific case studies and further practical advice. Overall, the documents will be addressing core issues of (1) research infrastructure set up, (2) the monitoring and (3) socio-economic impacts beyond the establishment, geographically putting also focus on the specific situation in the Danube macro-region. The concluding 4th Dialogue Workshop will take place in Zagreb during March 2018, topically it will focus on the use of ESIF funds for the establishment of RIs; followed by an extended event in June 2018 which will cover all four specific Dialogue Workshop fora topics which will also present the prepared guidelines. Further information is to be expected soon!